Granted, when we hear stories of the celery’s nobbly brother celeriac, our minds aren’t awash with images of natural beauty. I mean, how could he ever overshadow the chiselled frame of that dashing celery? However on tasting this little fella I can’t help but think people are missing a trick here; he’s a beauty. In the last few weeks, we’ve been pulling up a couple of celeriac at a time and so far I’m delighted with them. Once the foliage and skin have been removed they’re probably the size of a golf ball. So although not the biggest, the taste still packs a punch. I recently read that the garden dandy, Monty Don, likes nothing better on Boxing Day than to sit-down to a bowl of chestnut and celaric soup. Don’t know if his dog Nigel feels the same way, but it does sound like a cosy treat. I’ve always been an admirer of this misunderstood soul and will always make space for his nobbled presence on my plate. And to discover Soph has now been adding him to winter soups, well that’s even better! There’s truth in the saying ‘It’s what’s on the inside that counts’, no more so than for this little beauty. Next Where to Hang my Baubles? I have only had celeriac in Germany and loved it. Wish I had more room and better soil in my garden but…. great you can indulge your own tastes 😊. 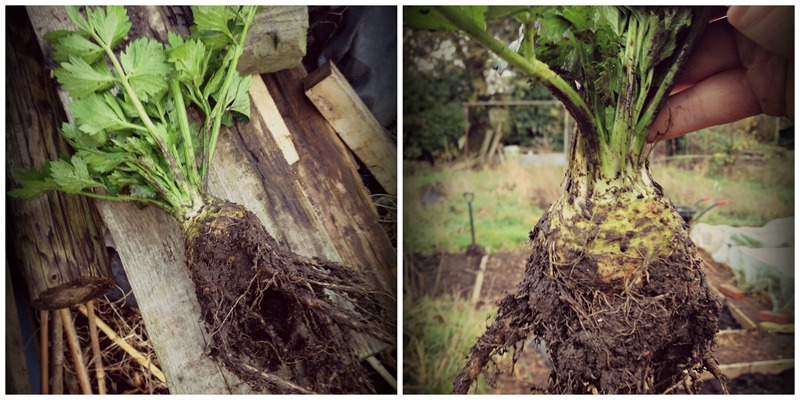 I was relieved it wasn’t going to be a blog about knobbly Jerusalem artichokes. I recently chose to eradicate mine due to too many disturbed nights after eating them. But I love celeriac and coincidentally one of the elderly gents on my allotment proudly showed me his first crop this autumn. No one should have a ‘disturbed night’, say no more. Funny, I always drop an association with the older generation, don’t know why, I think those guys and gals are onto something. Love celeriac – I made a soda bread a while back with celeriac and Lanark Blue cheese – twas pretty darned good! So impressed with your green fingers. Thank you! We’re pretty impressed with your cheese-making exploits! Must try it some day. Thanks for sharing.